Review: Nina. Curve Theatre Leicester. – East Midlands Theatre. Nina, a one-woman show performed by Josette Bushell-Mingo and devised in collaboration with director Dritëro Kasapi, is both a blazing political outcry at ongoing prejudice against black people and a celebration of the life of Nina Simone. Weaving many of her own very personal experiences in with those of the legendary singer-songwriter Nina Simone, Bushell-Mingo’s show is uniquely challenging in refusing to let the audience ‘just’ enjoy the songs that have become popularised. It feels like there was once an idea, to present and celebrate the life of Nina Simone, but during the creative process a realisation occurred that by simply covering the songs they would miss the point of Nina Simone. The point being, that it would not be honouring the political activism which was at the heart of Simone’s life, starting from the age of 11 when she was asked to sing in a ‘white’ church but refused to do so when her parents were ushered to the back row because they were black. 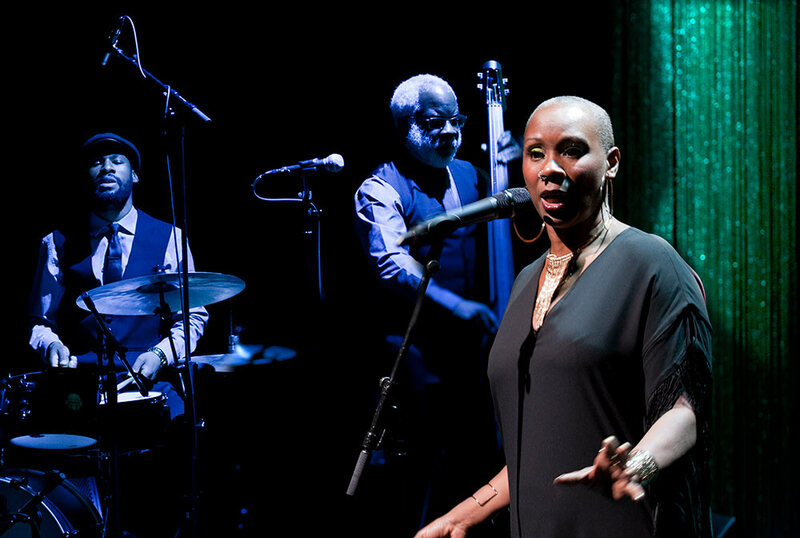 The show is a hymn to the whole of Nina Simone’s beautiful ethics, songs, politics warts and all. Therefore Nina has to be a political statement in itself. There is balance and humour here too, especially when Bushell-Mingo recalls the neighbourhood ladies who came to sit with her through the night before her mother’s funeral. They sang and cried and ate and laughed and walked through that difficult night by her side. This was an act of community which is/was more useful and true than the ‘white and democratic’ God she has been brought up to believe in. When Bushell-Mingo finally decides to perform the songs, her vocals are incredible: powerful, rich, effortless and controlled, like liquid gold. She sings alongside three sensational musicians, all completely absorbed and self assured, riffing on piano, bass and drums, improvising in the mix of jazz, classical and popular music which was so gloriously unique about Simone’s song writing approach. It leaves the audience craving more, even desirous to sit in a dark club and just absorb the wonderful expressiveness of the music. The amazing Josette Bushell-Mingo presents Nina like an impossible choice of aperitif on a platter – cocktail or gun? You can’t enjoy the one without acknowledging the presence of the other. Review: Hedda Gabler. National Theatre Tour. Nottingham Theatre Royal.